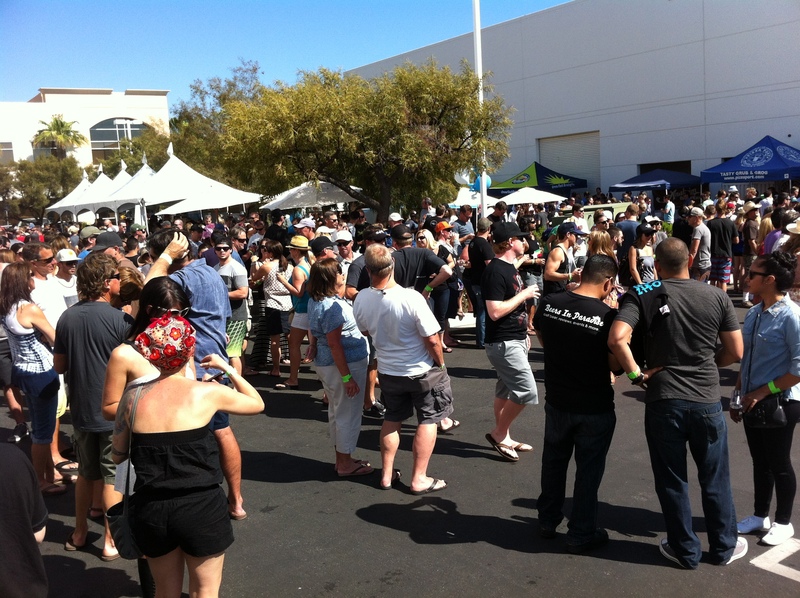 I just found out about a new beer festival, the Central Valley Beerfest in Turlock on June 1st. I was hoping it would be filled with local and regional beers from Northern California. I don’t mean to sound like a snob, but looking at their poster, I was extremely disappointed. I don’t mind that the big beers seem to be the focus; I would just choose not to drink them. It’s a beerfest — all kinds of beers should be represented. But the absence of so many good local and regional breweries is a shame and the opportunity to expose beer novices to the world of craft beers is missed. It looks like they are still adding breweries to the lineup, so there is hope. I’ll wait a few weeks to see if the lineup fills out before making the decision to attend. We enjoyed some quality time in Pacific Grove and Monterey. 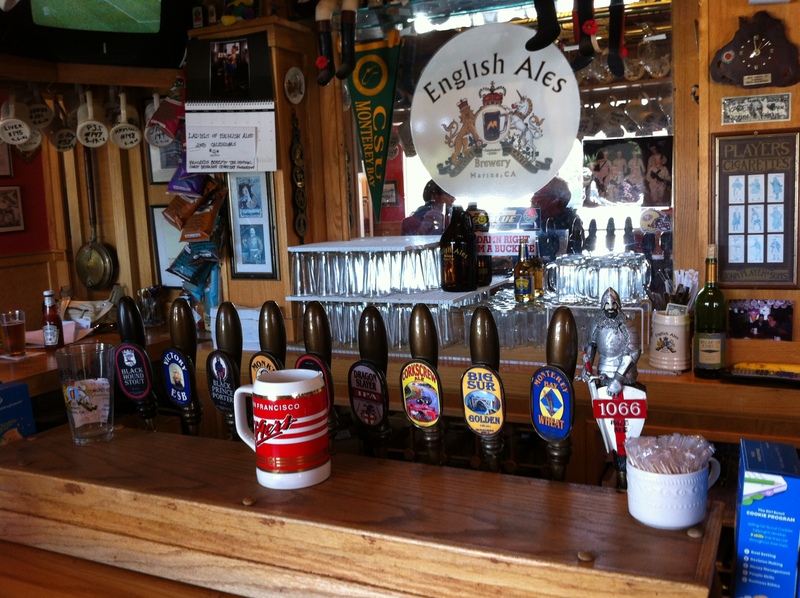 We tried to visit Peter B’s Brewpub in Monterey, but it didn’t open until 4 p.m.
We did stop at one last brewery — English Ales Brewery in Marina. What a treat! My favorites were the ESB and the Stout. The pub was intimate, with the ceiling covered in beer club members’ steins. The bartender, Karen, was friendly and welcoming, exactly what we had been looking for all week! In fact, the entire bar was welcoming, including the woman making origami animals at the far end of the bar. The bar also serves food (although passed on dining as we had just had a great lunch on the Monterey Wharf). We headed out, bought some artichokes in Castroville and got home in the early evening. After visiting my folks in Oceanside over the weekend my wife and I decided to take a two-day beer trip up the California coast. We planned to follow Highway 1 today from San Clemente to Santa Barbara and have a progressive meal. Our first unofficial stop was to purchase tickets for the San Clemente Micro-Beer Festival on April 20 (my sister and I have made this an annual sibling event). Stop One: Appetizer at Newport Beach Brew Co.
We leisurely drove up Highway 1 through southern Orange County heading toward Newport Beach. We arrived at NBBC at about 12:15 p.m. I thought it was pretty slow for a Monday lunch crowd. There were only three other folks in the place, all sitting at the bar. We sat inside, near the patio door (we would have sat outside but it was far to windy). None of the beers really excited me too much, and, as I expected, I favored the IPA. The nachos we ordered were okay, nothing special, with cheese and beans on them. They seemed like they might have just been heated in a microwave (we heard the microwave dinging too many times in the kitchen for our liking, suggesting other items may be equally lackluster). I asked our server who Old Man Jenkins was, but she really didn’t know. That disappointed me; she really wasn’t knowledgeable about the beer lineup. The pub had a cool feel to it. Lots of TVs and I’m sure the place hops in the summer and weekends. Next, we drove to Long Beach hoping to hit Beachwood BBQ. I was able to try their beers at last year’s San Clemente Beer Fest and hoped to try their barbecue. I should have checked first to see if they were open! We noticed Belmont Brewing Company was nearby so we made the short drive to their beachside location. Again, we would have loved to sit outside, but the wind was too fierce. I ordered the beer sampler and a Chicken Bleu Salad, while my wife had the Lobster Bisque and a mojito. Sara’s mojito was disappointing is there was a minuscule amount of muddled mint. The salad was very good with a mild lemon dressing. Very refreshing. Sara thought the lobster bisque was good but not worthy of the praise she read on Yelp. Interestingly, Sara’s soup arrived way before my salad. We thought they should have been delivered together. Our server dropped off the beer sampler without any explanation of the beers (yes, there was a description under each glass, but I had to guess the Smash IPA was the special ale. My favorite of these average ales was the Pale Ale. Both Sara and I enjoyed the Strawberry Blonde (weird for me, as I don’t care much for blondes). The atmosphere was “vacation casual.” The place was pretty empty and lifeless, but it was around 2:30 so we may have been between crowds. This had become an enjoyable road trip with somewhat disappointing beer stops…until we hit Anacapa. Located in Old Towne Ventura, this brewpub provided what we had been seeking all day – good service, a lively crowd, tasty food and pretty decent beers. We shared the Pretzel Fried Chicken with polenta and vegetables. Very good! The NCAA Championship game was on and the patrons were definitely engaged. The place was packed for a Monday night. Our server was efficient and attentive, a first for the day. We decided to finish our evening with dessert at SBBC. The hostess gave us a bit of attitude and was hesitant to seat us at a table since we were just ordering dessert and drinks. Our server had a much better disposition. I ordered the beer sampler and Sara had a Kahlua and Coffee. None of them “wowed” me but my favorites were the Red and the Stout. We had a choice of Chocolate Lava Cake or Cheesecake (strawberry or caramel) for our dessert. We chose Strawberry Cheesecake. I expected a slice of cheesecake with strawberries on top. What we received was a slice of strawberry-flavored cheesecake. Eh. Disappointing. The place was jumping as we watched Louisville defeat Michigan to win the NCAA championship game. We headed to our lodging for the night, the beautiful Montecito Inn in Montecito (Charlie Chaplin was one of the original investors). Overall, this was a beautiful day of travel up the California coastline. I didn’t find any outstanding beers (but then again, there was only one I truly disliked). Tomorrow, I have very high expectations as we’ll be hitting one of my favorite breweries, Firestone Walker.